San Francisco is the fourth most populous city in California with over 800 thousand people as of the 2010 Census. It is the financial and cultural hub of the larger metropolitan area, with a population of 7.4 million. San Francisco is one of the top tourist destinations in the world, renowned for its landmarks, including the Golden Gate Bridge, Chinatown, Alcatraz, and the famous cable cars. Some people say that dating in San Francisco is often very challenging... Nevertheless, here we list some nice date spots in SF, we feel you might like. There are a lot of good coffee shops to meet up in, many great restaurants, beautiful scenery, parks, entertaining events, museums, and galleries. Golden Gate Park offers a truly beautiful spots for daters. It is the third most visited park in the U.S., larger (1,017 acres) than Central Park in NYC. The park is filled with gardens, flowers, lakes, art, museums, and wildlife. 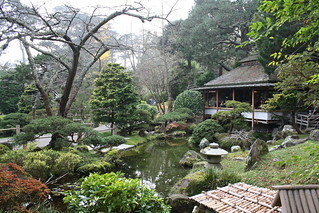 The major attractions are: Conservatory of Flowers – a greenhouse and botanical garden with many rare and exotic plants; California Academy of Sciences – a natural history museum, the Steinhart Aquarium and the Morrison Planetarium; Japanese Tea Garden – the oldest public Japanese garden in the United States with numerous paths, ponds, bridges, and sculptures. The Golden Gate Park can be a great dating experience for both of you. Next to the park is Ocean Beach, a popular place for surfers and bonfire parties. It is a part of the Golden Gate National Recreation Area. At the northern end of the beach, you will find a historic landmark, the Cliff House, where you can enjoy a Sunday brunch with your date. It offers a gorgeous views of the Pacific Ocean together with a beautiful sunsets you won't forget. For a more active, outdoor dating, you can choose a nearby Lands End Trail – a wild and rocky northwestern corner of San Francisco, which will reward you with a stunning view of the Golden Gate Bridge from Lands End Point. Did you ever truly walk across the Golden Gate Bridge? Taking an hour long walk with your date, across the bridge, can be a good way to get to know each other. You both will appreciate the majestic beauty of the bridge alongside the amazing views of the city's skyline. The North Vista Point and Battery Spencer (Marin County) offer spectacular and probably the best views of the bridge. The city is a multinational and multicultural, which in turn has a significant effect not only on dating in San Francisco, but also on the local gastronomy. The fusion culture combines attributes of diverse cuisines from around the world. This resulted in new and better variants of various dishes, of which the most popular are undoubtedly burrito (one of the best served at La Corneta Taqueria and Mamacita), cioppino available at Cioppino's, and California roll that Ebisu and Sushi Zen are known for. Moreover, SF is home to sourdough bread. The proximity of the ocean caused the main ingredients used in San Francisco cuisine include fish and seafood with Dungeness Crab at the top (excellent in Bar Crudo and Thanh Long. The venues of choice in the city are well-known Tonga Room, Fleur de Lys, Greens, and Original Joe's that offer specialities at affordable prices. California is famous for originating high-quality wines at reasonable cost. Therefore it is not surprising that its consumption is continuously growing, and this noble drink is winning new enthusiasts over, and crowds out bourbon whiskey. The most appreciated one is Charles Shaw, awarded the double gold medal in Annual International Eastern Wine Competition. In the city you can find a wide range of wine bars perfect for a date. We recommend especially a visit to the Nook, Vin Debut, or Barrique. Dating in San Francisco for revelers is a pleasure. If you fancy a drink, finding a suitable place in the city should not be a challenge at all. You can choose from about 10,000 venues in the city and most of them are located in close vicinity to Chinatown and North Beach. 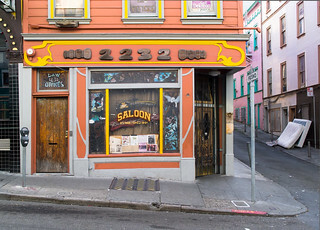 We recommend visiting Vesuvio, Li Po Cocktail Lounge, and The Saloon that is considered to be the oldest bar in San Francisco downtown. What you can also do is exploring The Marina – a lavish singles scene of San Francisco, with its many bars (Marina Lounge, Eastside West Restaurant & Bar) and nightclubs (MatrixFillmore, Comet Club). Regardless the kind of music you prefer the most, you can always find some interesting meeting places in San Francisco. Dozens of multi-level clubs located in South of Market district offer revelry parties till daylight, raved-up by the world's best DJs. While in the area, you should visit DNA Lounge, 1015 Folsom, and Ruby Skye.